Along with Shanghai and Hong Kong, Dubai is one of the world’s cities where some highly unusual buildings are being designed and built. Many of these have curved shapes that are difficult or impossible to realize in heavy building materials like concrete, steel, and glass. Composites, which engineers are using to build spacecraft, seawalls, and car wheels, are now helping architects to make curved and freeform shapes in large buildings in the Middle East. Affan Innovative Structures, based in Dubai in the United Arab Emirates (UAE), has combined a carbon fiber with Dow Chemical’s Voraforce TF epoxy infusion systems. The company is using the composite material to build non-load-bearing structures in projects such as the Yas Mall in Abu Dhabi, UAE, and the Sidra Hospital in Qatar, which are both under construction. Amer Affan, the company’s founder and managing partner, told us the curved architectural panels created using Dow toughened epoxy technology have many advantages compared to steel, the conventional material. The composite reduces weight by 85 percent and is 1.9 to 2 times the strength of steel, although its flexibility and toughness are lower than steel. Strength and a light weight, along with the material’s energy absorbance, are also important in the earthquake-prone Middle East to help reduce damage. This was especially advantageous for the design of the canopy foundations in the Sidra Hospital. 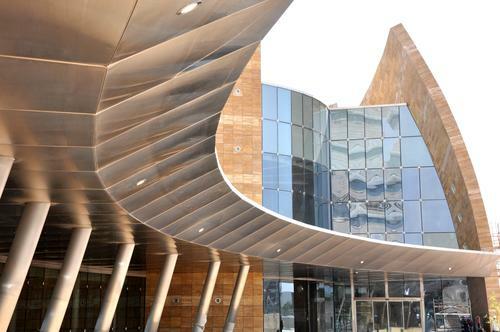 The composite material was used in the pillars and roofing of the hospital’s entrance area. The roofing panels made of the composite measure 15m to 25m (49 ft to 82 ft) long. None of these structures are load-bearing. Composites are important to allow architects freeform shapes in buildings. Using metal it would take a lot of effort both in time and money to achieve these architectural forms. The same characteristics of composites that have benefited automobiles, aircraft, and sports equipment are also proving beneficial to architects. In many ways, composites can be a dream solution for architects and I am convinced that they will decisively influence the future of construction. Affan Innovative Structures provides design, engineering, fabrication, and installation, focusing on construction projects that require a high degree of design and engineering in steel and glass. The company is actively constructing large-span roofs such as those in sport stadiums. In stadium design, the trend is to reduce the number of support columns, which can obstruct the spectators’ view, and also to have roofs that can be partly opened, such as in year-round sports arenas, said Affan. Light, structurally strong composites have a technical advantage over traditional cladding or roofing materials in achieving those goals. Because the composite materials are molded, the shapes can be extremely accurate and have very high-quality surface finishes.